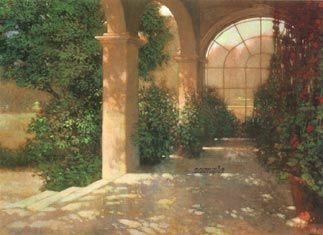 Philip Craig Hand Signed and Numbered Limited Edition Print "Palladian Sunroom"
Image size:18 1/4 " x 24 1/4 "
About the Artist: Philip Lorne Craig was born in Ottawa on July 29, 1951. He began his art studies in 1965 by enrolling in the Creative Arts Program offered by the Ottawa Board of Education at Fishe Park High School. After graduation, Philip continued on to Sheridan College in Oakville Ontario as a graphic design student. In 1971, he returned to Ottawa to take up a position with the Canadian Broadcasting Corporation as a television graphic/set designer. Then, in 1975 he competed and won the position of Art Director for C.B.C. in St. John's Newfoundland. Throughout his design career, Philip continued to paint and experiment with the acrylic medium. By 1985, demand for his work had become so great, he was forced to choose between painting full time or remaining with the corporation. He decided to resign, return to Ottawa and pursue his talents in the Fine Arts. Philip's work is represented in a large selection of corporate and private collections throughout Canada, the United States, England and Europe. In October of 1991, Philip was pleased to present Her Royal Highness, The Princess of Wales with an original work entitled, 'Constance Creek'. Today, Philip resides in Ottawa with his wife Diane, their three children Jordan, Shannon and Johnathan, and an assortment of ever changing pets.